Please consider making a cash donation to aid earthquake relief efforts in Haiti. There are several responsible agencies on the ground there. 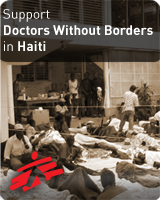 One is Médecins Sans Frontiers (Doctors without Borders). Americans can donate though the American website; others can make donations through the international site.